Copyright 2017 DaFashionFreak. Powered by Blogger. Hey guys! How has been your week so far? TGIF yeah? 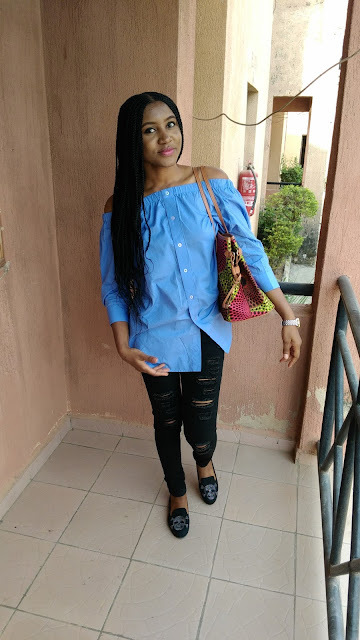 So I've been doing some sort of survey on social media and thanks to a blogger friend +Dami O I realized it'd be better to create a blog post on it as well as take the survey here. Thanks to all those that have participated on social media. You can also respond here. Please, kindly answer the questions below. Thanks for your time. Hey guys! How are you doing? I promise to keep this short. 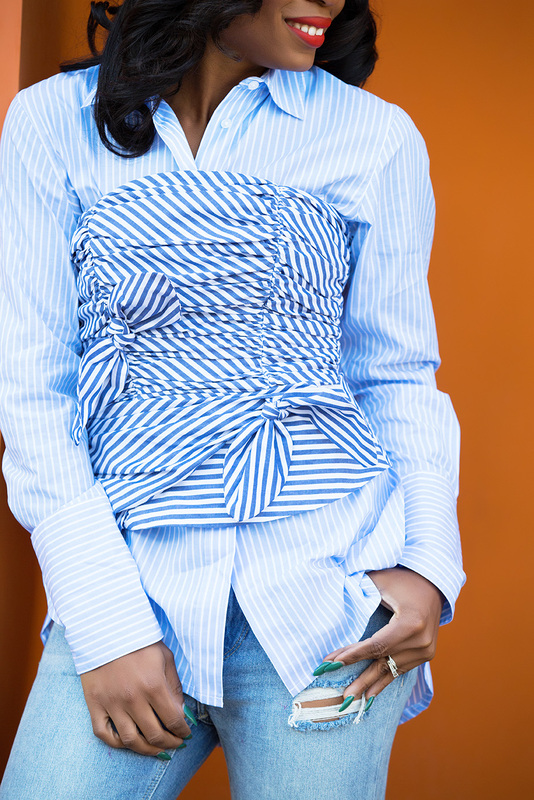 On today’s post, I’m styling double denim; wearing two of my favorite trends. If you’re thinking mom jeans and denim jacket, you’re right. So for my take on double denim, I decided to pair mom jeans and denim jacket because it’s just one of the best ways to wear double denim. I wore a really light textured vest as the weather is of course warm though we’ve been experiencing a good measure of rainfall now (thankfully). Speaking of the vest, I’ve had it for quite a long time, say - four years. Trust me, I’m very good at keeping/maintaining things not only clothing. I finished my look with a pair of my favorite black mules and black cross-body bag for a dressed up minimal look. And to dress down my look, all I did was switch the mules for plimsolls. Which brought about a sporty and more relaxed look. Meanwhile, if you’re not into rain boots, rubber soled plimsolls are also good for rainy days. They actually protect your feet from water/mud and the fact that the sole is made of rubber means the water won’t even spoil your shoes. Plus you could easily wash off mud stains from the shoes. Thought I share this tip since it’s the rainy season. Oh by the way, did you notice how I added Ankara tassels to my bag? Well, that was pretty much my best shot at Ankara daily for this look. Fail? I’ll do better next time. I plan to get more Ankara accessories. As they seem to be a quick and easy option when it comes to wearing Ankara daily. I’ve had my eyes on a particular Ankara boy-bag for quite a while now. I simply cannot wait to lay my hands on it (to purchase it actually). And I definitely will not hesitate to show you on my Instagram as soon as I do. So guys, how would you style double denim? Which look do you prefer more – the dressed up or dressed down look? Please, let me know in the comments below. Thanks for stopping by. And please………, kindly share. I’m wearing florals again… I haven’t had enough of florals just yet. And I do plan to style some more. So how has been your week so far? I’ve been really busy. I’m unable to even keep up with the new blog post schedule I talked about. Hoping to bounce back to it shortly. This matching set of kimono and romper is my design. I made the pair way before I started the Maudiffied brand. And now I’m working on adding these pieces to the brand. Because of the positive replies I received on Instagram and twitter. Plus. I’m guessing some of you are loving it already. But please bear in mind that I just might not find fabrics of this particular floral design. Well, not to worry, trust me to get something even better. What I’m saying is, rather than cover up in layers of head to toe florals of same design, it’s actually more appealing to show off some skin. Yes, the key is to show off some skin just like I’ve done here. I’m trying to picture my romper being a full length jumpsuit paired with the kimono. That’s a sight I definitely cannot imagine. To be a little extra with florals, you could then wear shoes with same or different floral design (as you please). Also, you could accessorize with a floral bag. Although, in my case I choose to be minimal as usual and finished the look with my go to box clutch and black pair of low block heeled sandals. These sandals are the definition of comfort! Note that my opinion on the do’s and don’ts above are strictly related to layering matching floral prints. Because, floral maxi dresses are totally cool – I love them. A matching floral top + pants set are cool too – I wear them. A matching floral top + skirt set are also cool – love and wear them. So please don’t get me wrong. In the end, they are just my opinions. Which brings us to the end of this post. What do you think about the idea of showing off some skin when it comes to layering matching floral prints? If your religion does not permit showing off skin, how would you layer matching floral prints? If you were to wear any combo from my Don’t Wear list, which would it be? I’d love to know, kindly reply in the comments below. Thanks. It finally rained!!! The kind of rain I’ve been praying for. Thankfully the weather is cooler now. Since the year began, it has been really hot here in Abuja so I just could not contain my excitement when it rained on Thursday’s evening. Too bad network services have been poor and that's the reason this post is coming a bit late. But still, I thank God for the rain. So I won’t complain. For someone who loves rain, I just have to be thankful. So going into today’s post, I incorporated floral and denim to my outfit. This combo was inspired by two factors; floral season and the vintage denim trend. Actually, this isn’t the first time I’ve styled this exact pleated floral skirt and sheer camisole. I’ve previously worn the set but not with denim. Then I wore a black waterfall jacket (not on the blog though) those who follow my Instagram must have seen it. But this time around, I decided to be a bit more stylish and completed the look with a denim jacket and a pair of block heels in pastel peach. To accessorize, I wore a statement neckpiece and hung my little black wooden trim box clutch. Meanwhile, my skirt was initially a full length, I had to cut it to my desired length. And my camisole happens to be a bit rumpled. Wanted to quickly iron it, but my photographer was like “don’t worry, it won’t be noticeable in the pictures” Isaac you lied to me!!! After shooting these photos, I was viewing them on my laptop when I realized just how much the outfit reminds me of an outfit I once saw on blogger Cassie Daves – a floral dress and a denim jacket. 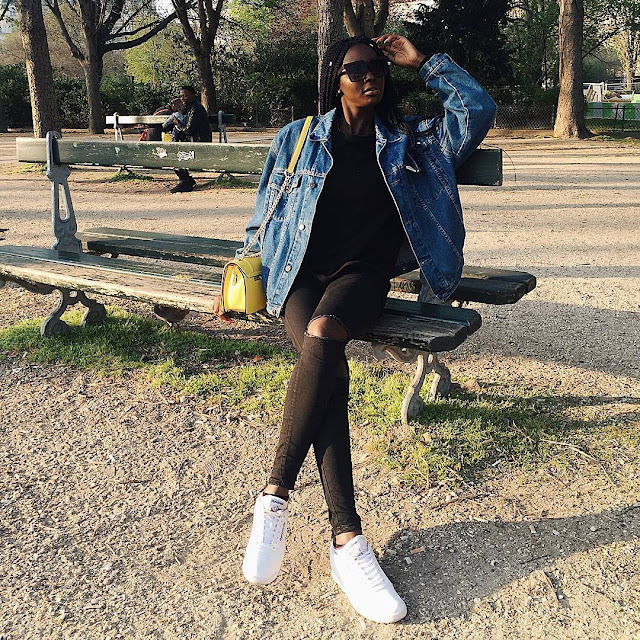 Well, she sure does love her denim jackets and never disappoints when it comes to styling them. I must say that she is one of the people that made me love denim jacket. Another person that grew my love for denim in general is Lisa Folawiyo. She slays denim in her own way and I love her style. She is such an inspiration! So what do you think about pairing floral and denim? Would you have preferred my pleated floral skirt in the original length? Please, let me know your thoughts in the comments section below. Thanks for stopping by. Have a great weekend. PS: It was brought to my notice that it has been a bit difficult leaving comments here, my apologies guys, that was google+ comments wahala. I finally disabled google+ comments on the blog. So we’re back to blogger comments which is a lot easier. Thanks and I can’t wait to read your comments. Hey guys! How has been your week? On today’s post, I’d be talking trends. I’ll try to be as brief as possible and avoid talking too much. Personally, I invest more in timeless pieces as they’re never out of style, can be styled in numerous ways, and can be worn whenever I please. So when it comes to trends, I’m quite picky. Especially with awkward past experiences – like, after buying a trending piece with your precious money, you discover people stopped wearing it and you practically just feel awkward when you do. But somehow I’m loving this year’s trends. 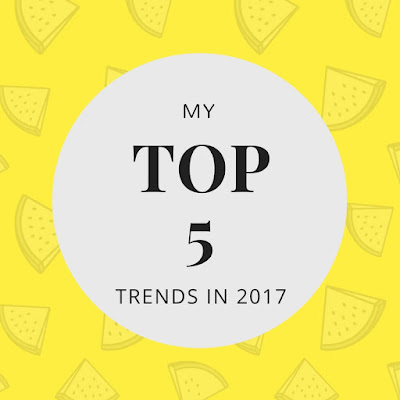 And I’ll be sharing five trends I’m loving. Maybe because some of them are pieces I regard as timeless. So it’s a win win for me. 1. STRIPES: I’m dividing this into two; Banker stripes and Statement stripes. The banker stripes also known as oxford stripes are the usual thin shirt stripes and they mostly come in blue stripes. But this year, banker stripes aren’t limited to shirts alone. They come in various forms of fabulous dresses, skirts, blouses and more. While the statement stripes are of course bold stripes in vibrant colours and are styled various ways. For that trendy look, you could switch your white shirts for banker stripes. 2. COMFORT SHOES: Mules, slides and low block heels in general. Let’s be real, who likes to suffer? There’s nothing like being stylish yet comfortable. And I love love the fact that comfy shoes are in! Most of the time, you’ll find me wearing low block heels. They are super comfy, chic and gives an effortless look. Why should one suffer in killing heels? 3. RUFFLES: For the love of frills. I’m a lover of anything chic. And frills give me just that sleekness. I won’t necessarily wear a total bust of ruffles but I love just a cute detail on my clothing. 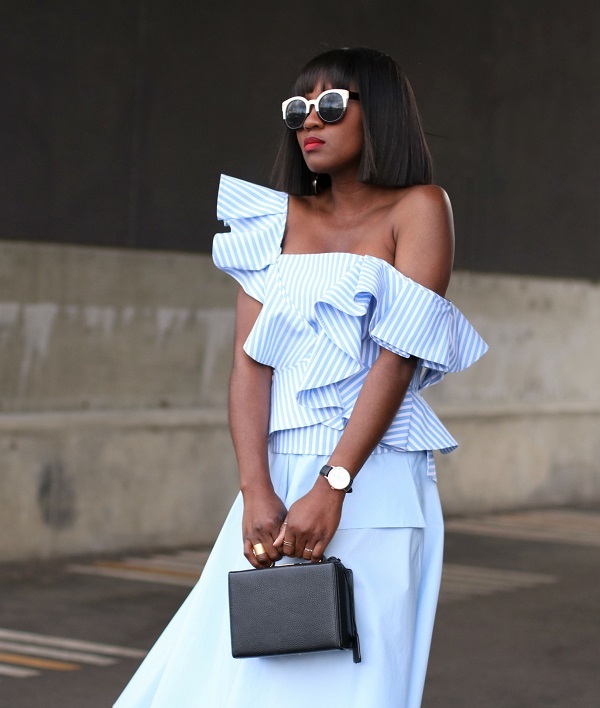 If it’s not asymmetrical dresses and skirts, I prefer ruffles on my tops. 4. VINTAGE DENIM: I mean non stretch jeans. Mom jeans, denim jackets and skirts. They are vintage, timeless and now trending. What else could I ask for? There are diverse ways to style denim and I simply cannot wait to share with you how I’d style them. 5. SHOULDER DISPLAY: Off shoulders, cold shoulders, one shoulder, whatever form they want to come in. I love showing off collarbones and I find it totally appealing. If you know me, then I believe you’re not surprised to find off shoulders on my top 5. You know I just had to include this right? And I wish this trend is here to stay. Off shoulders were big in 2016, but I can’t really say about 2017. Hoping they’ll be bigger this year. 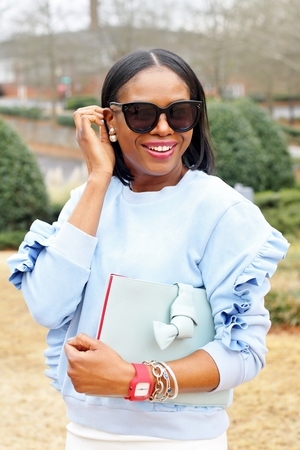 Although this is meant to be a list of my top 5 trends so far this year, I can’t go without mentioning exaggerated sleeves! Too bad it didn’t make it to my top 5, I couldn’t decide which trend to switch exaggerated sleeves for. But I do see myself styling bell sleeves, bishop sleeves and flared sleeves. So that’s it guys. My top 5 trends so far. What are your favorite 2017 trends? If you were to switch one trend on my top 5 for the exaggerated sleeves what would it be? Please, share your thoughts in the comment section below. Hope this week started on a good note for you? Mine seems to be good enough as I’m starting the week with an outfit post. Well, I’m trying to start and hopefully stick to this new blog post schedule. Going forward, there will be two outfit posts and one random post weekly on the blog. So you should expect outfit posts on Mondays and Fridays. While the random post would be mid-week. That is Wednesday. On today’s post, I’m styling a simple pair of black high waist pants. You see, I needed to get ready for a Sunday brunch and I had not planned what to wear. So I decided to stay safe and do “simple”. I picked up this pair of black pants and had to put together a look. I grabbed my go to mules, picked my wood trim clutch bag, but thought within myself that I wasn’t going to put on just any blouse for this look. I realized I needed a statement blouse to style the look I was creating. Then I remembered I had a piece of chiffon floral fabric and in no time, I made this flowing off shoulder blouse! And the look I was creating instantly became stylish- Just the way I wanted it to be. I finished my look with an irregular shaped bangle and I was ready to go. 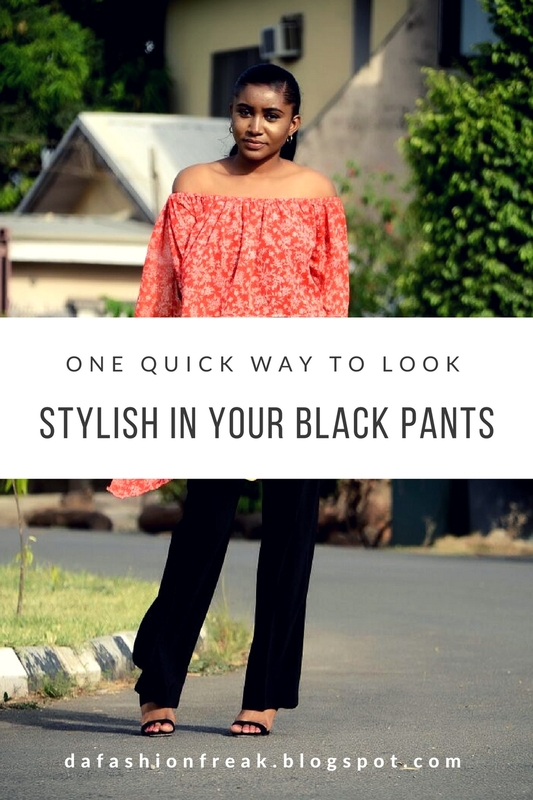 So guys, how would you have styled a pair of black pants if you wanted to make a statement? Please, let me know in the comments below. Thanks for taking time out to read. Until next time. Hey guys, Happy new month and Welcome to April! I'm including something new to the blog. "Taking Stock" - A list of reflective questions that help you stay aware of little details about your life. You know how we tend to get so busy and carried away with life, we miss out on the little things that actually help shape our lives. So, I'm taking stock because I want to remember these little moments. I'd like to come back to read this post in some months or years time and be awed by the things I did. Now, I'd like you to know that I didn't invent this. Credit goes to Pamela of HeelsAndAbout for bringing this idea to my reach and to MeetMeAtMikes the originator of Taking Stock! The only changes I've made to the list is the alphabetic arrangement and addition of some questions. Going forward, Taking Stock would be the first post of each month and I promise to try as much as possible to answer these question honestly. Accepting: The fact that I cannot keep up with all the telenovelas and Bollywood series DSTV has offered! Sometime ago I saw channels called EVA and EVA+. And my mum still wants to follow all. Haba? 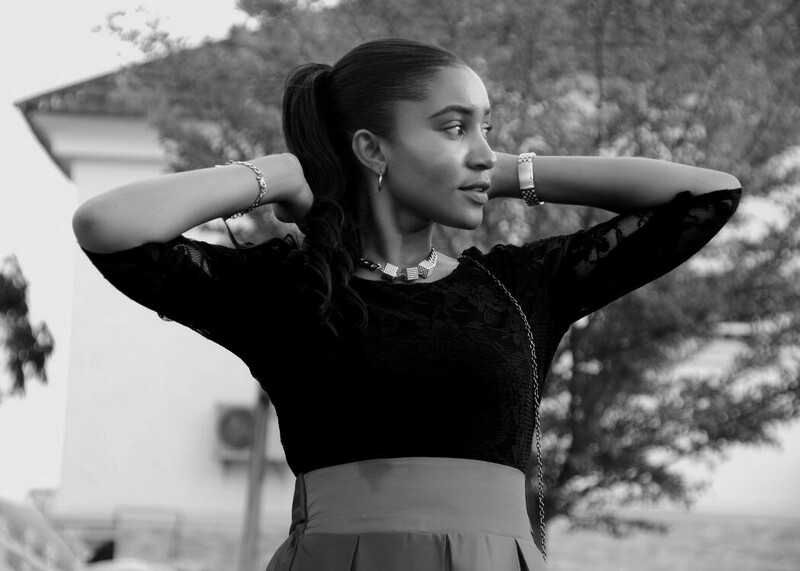 Admiring: All female entrepreneurs out there. The work is not as easy as it seems. Bookmarking: How to blog better. Celebrating: Every good thing about life. Even the small victories. Cooking: The heat has been mad. And I’ve been running away from the kitchen. But, the last food I cooked was vegetable soup. Changing: (Changed actually) My approach towards blogging. A lot has changed over the years and I’m learning by the day. Creating: Posts schedules on all my social media. Makes the work a lot easier. Deciding: That it’s better to pick my favorite TV series and stick to it till it ends. Discovering: Better ways to blog. Disliking: Dark knuckles (on light skinned girls). Especially when the fingers don’t just match the person’s face! Plan to do a post on remedies for dark knuckles. Eating: Amala + gbegiri + ewedu + lots of assorted meat. I recently discovered a local restaurant called “Iya Oyo” somewhere in Wuye, Abuja. And I’ve been visiting that place a bit too often. Embracing: The idea of seeking advice from professionals. Be it health wise, career wise, etc. Feeling: Thankful for the gift of life. I mean it’s a new month. First quarter of 2017 is gone. Following: Creative blogs. Please, tag me if you got/know a blog that I need to check out. Giggling: at this funny video about how Nigerians react to kidnapping here. Hearing: Generator noises. This is Nigeria. Hoping: That you enjoy reading this post as much as I enjoyed writing it (typing it). Knowing: That I serve a living God and that everything is working for my good. Loving: My glittering silver manicure. Cute right? Making: Blog content plans for the coming months. Marveling: at sunset by the beach. I’ve seen beach sunsets only in photos/videos but never had a personal experience. Needing: To experience sunset by the beach. Okay to be serious, what I need right now are more hands to assist me in sewing. Noticing: That the flowers are blooming because they’re being watered. It hasn’t really rained. We’ve just been getting teased. Opening: Not another tab in the background. Playing: UK Top 40 songs here. Reading: Haven’t started a book this month. I just finished “The secret lives of Baba Segi’s wives”. Any suggestions on what next to read? Sewing: The Maudiffied African prints collection. Wanting: To soak myself in a pool or bathtub. Wasting: Lots of water. Because I have to shower at intervals. The heat is not friendly. Wearing: My hair up. Because I don’t even appreciate the feel of hair on my neck right now. Would anyone be kind enough to suggest hairstyles that would be suitable in this ‘trying’ time? Wishing: For the rain… Lord please, send down the rain… The generous kind of rain that wouldn’t bring heat like the last one. (In my church they teach us to be specific in prayers). Wondering: How hot hell would be. Why is Abuja so hot though? Thanks for reading guys. Again, I hope you enjoyed reading this as much as I did typing it. Please leave your comments and don’t forget to share. Wishing you a month to remember. My name is Maudleen Imonirioma. 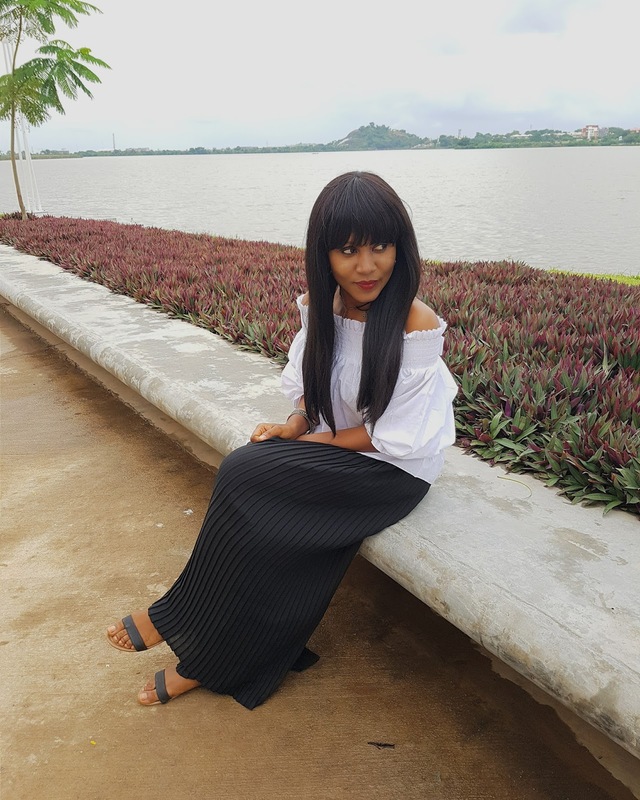 I'm a Nigerian blogger and fashion entrepreneur. The creator of Maudiffied (a growing clothing brand). I'm glad you came by and I hope you'd be glad you did.